I believe I mentioned my family tried meatless Monday for a spell. I think we lasted 3 or 4 months before we ran into some difficulty in staying true. Lunches were definitely my Achilles heel. Having enough time to plan ahead for my busy schedule especially during the summer months; I was just not organized enough nor creative enough being such a meat and potato kind of girl. Who knows we may try it again at a later date. It was comical to me how many of my co-workers and close friends thought we were nuts. My girlfriends 8 year old had one of my favorite comments. “What are they going to do next Taco Tuesday” I love it!!! And also thought what an awesome idea! 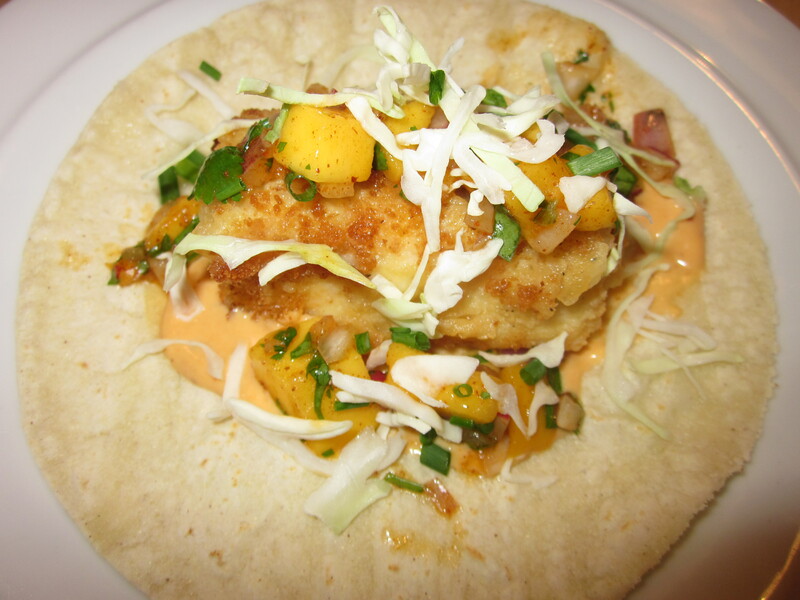 No; we did not start taco Tuesday but we have come across a fish taco recipe that we are definitely adding it to our meal rotation. We seem to make them when we have friends and family over. My father-in-law said they were the first tacos he has ever liked. Now that is saying something being that he is in his 80’s. Everyone has really liked them so I wanted to share them with you. Make the salsa, cover and put in the fridge until you need to use it. Make the mayo and if you have an empty squeeze bottle; I find it works really well, plus you can store in the fridge for another use. I bet you end up making these again within a month; maybe even the following week, I know we did. 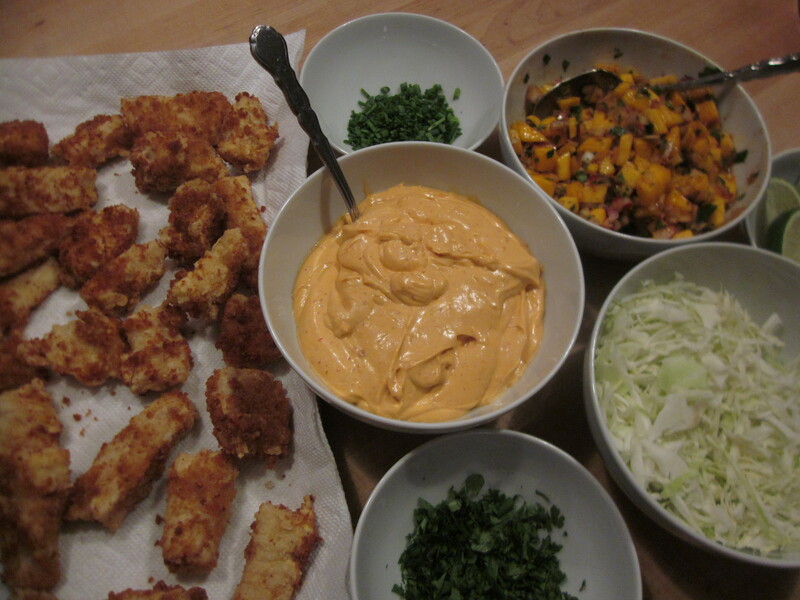 Cut fish into 1 ounce strips, set up breading station of flour, eggs with water and breadcrumbs. Salt and pepper each container. I use my glass Pyrex pie plates that I have had for years! Dredge the pieces of fish in flour, eggs, than breadcrumbs. Once all completed fry fish in small batches in 375’F oil. Drain on paper towels. Keep warm until ready to serve. in a blender put the chipotles and puree until smooth, add sour cream, mayo, adobo sauce and lemon juice and combine to process until the mixture is consistent and creamy. Season with salt and pepper and refrigerate until ready to use. Add all into a dish stir and refrigerate until ready to use. Serve Family Style: toast corn tortilla’s on a griddle or over an open flame on your stove top. I used my griddle it works great.